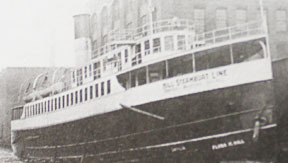 A proud product of the late 1800’s shipbuilding industry in Milwaukee, the Flora M. Hill was launched in 1875 with a length of 175 feet. She saw service on the Great Lakes for nearly 40 years until she was crushed by ice in 1912. Luckily, there was no loss of life in the incident. As the wreckage was a hazard to navigation, she was dynamited into a debris field by the Army Corps of Engineers in 1913. At the time of her sinking, she was hauling a load of solid brass lamps, some of which are still buried around the site. If you’re lucky enough to find one, remember to leave it there! The Flora M. Hill is an amazing wreck diving experience for divers who are either new to the sport or to the Great Lakes. We visit the Flora M. Hill from Hammond Marina.